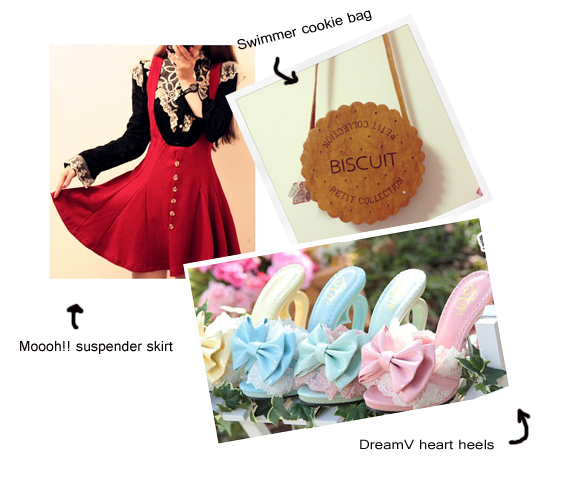 On this months wishlist are two items I have been interested in ever since I entered the J-fashion world. The Swimmer cookie bag and the dreamV heart heel shoes. I really hope to add these to my wardrobe some day! The suspender skirt is from Moooh!! My love for red is coming back so this skirt cached my eye. Are there items you have been eyeing on since forever but never bought them? welche marke is denn der rock? Ist vom etsy shop Moooh!! ich glaub fast es ist ein replica ..